For some cats, exercise is not much of an issue at all. My mom’s cat for instance, who is so obsessed with playtime if you even remotely near look like you’re going to take out a toy to play, he’ll come out of one of his favourite hiding spots running, and would happy stay by your side for a few hours of intensive exercise. Don’t play with him yourself? He’ll dart around the house sprinting to get some of his energy out. Hell, he’ll even go so far as to take his own toy balls and springs out of a basket and play by himself to his heart’s content! Not my cat – my cat’s the lazy kind. He’s the type of cat who prefers naps over a feather wand any day of the week. While my mom’s cat, Walker, always gave us trouble in the hydration department, my cat, Avery, has always given us trouble with his lack of exercise. Don’t get me wrong – Avery’s not an overweight cat, nor has he ever been (except that one time we tried open feeding with him; boy was that a failed experiment). 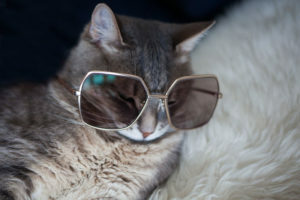 But whether or not your cat is overweight isn’t important: cats should get enough exercise regardless of whether they’ve packed on extra pounds. Which is why I always do my best to make sure I don’t drop the ball with monitoring how much time Avery’s spent exercising at home. In fact, I’d venture to say that extra exercise is barely going to help cats lose weight at all. If your mission is just to get your kitty to lose some, the best way you can help him/her do that is by controlling how much food he or she eats. 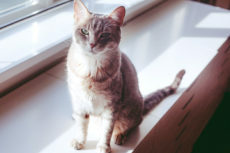 Luckily, even if you feed your cat multiple times a day and you love giving away snacks to your cat whenever he or she wants, it’s still easy to get your cat on a diet that works. Just do what I do, use this trick to prevent overfeeding. It’s quick, easy, you can keep using whatever cat food you’re already using, and you can dole out food as often as you’d like without having your purrfect cat gain a single extra pound. Still think your cat needs more exercise, regardless of whether his/her weight is good or bad? You’re in the right place! Let’s take a look at all the things you can do to get your cat to exercise more. I’ve split up this section into two: active & passive ways for you to help your cat to get more exercise. 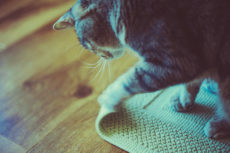 Active ways are ones that involve you physically doing something (like playing with your cat) to help, and passive ways are of course things you can do and have that will hopefully encourage kitty to get more exercise on his or her own. I’d recommend using a combination of these for the best results getting a lazy kitty to get that “time at the gym” in. 1. Make sure you don’t forget daily playtime! You should be having an active playtime session with your cat at least once a day, for I’d say around 15 minutes. If you’re not actively trying to have playtime with your cat at least that one time a day, you’re doing your pet a huge disservice! Cats need to get their hunting game on, it’s part of their biology, and if you don’t help them out releasing that energy during an active playtime with them, this lack of play can lead to behavioural and health issues later, even if they’re not quite showing up now. Give your cat what he/she needs – make sure playtime happens on the daily. 2. Playtime not happening easily? 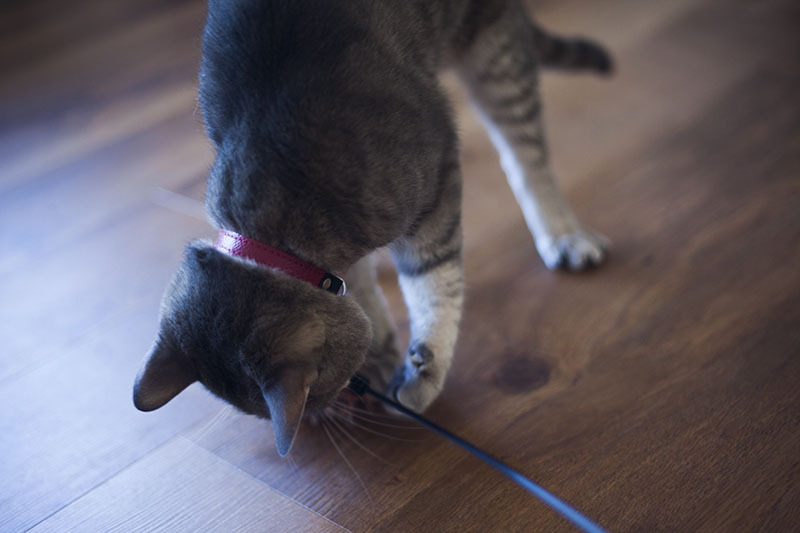 Try different cat toys until you find ones your cat really likes! 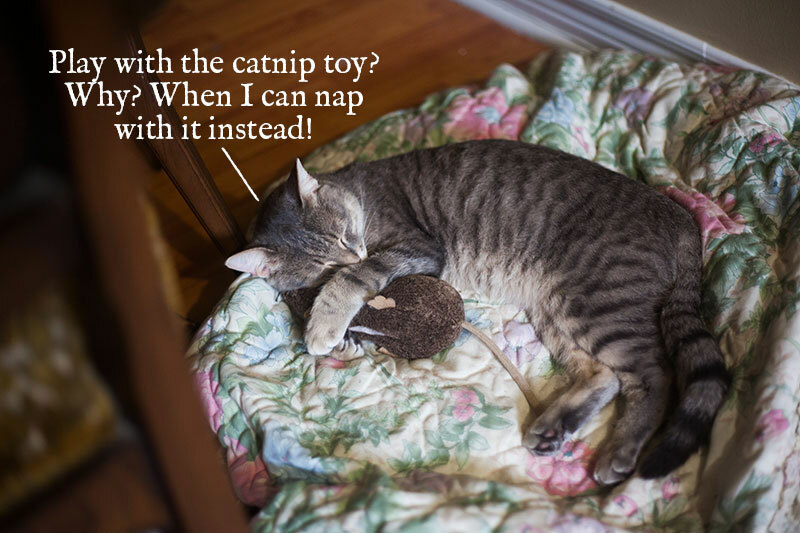 Finding a toy that your cat really loves is incredibly important if you have a lazy kitty. Some cats are great when it comes to playtime by default, like my mother’s cat, but others, like my own, are really picky about what they do and do not like to play with. 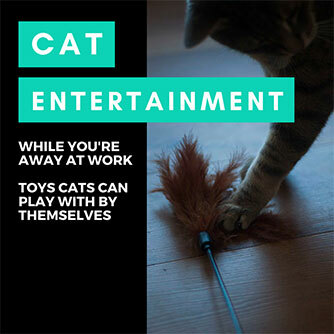 If you haven’t quite found the right cat toy, don’t fret! There are plenty of cheap ones on the market you can try so you don’t break the bank figuring out the type of cat toy your pet really loves. Check out this article for some suggestions. 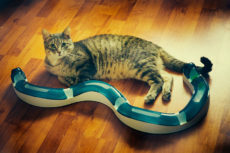 Looking for as many interactive and exercise-encouraging cat toys as possible? Check out my article specifically on cat exercise toys. 3. Playtime still not happening easily? Try different techniques to see if your cat engages better under the perfect circumstance. As I spoke about in my review of the toy, Avery is actually more likely to play if I start off his playtime by getting him to attack his Jeepers Creepers Catnip Toy Rat. Does it work every time? Definitely not, but it works often enough for me to use this technique quite often. 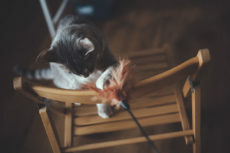 If your cat is difficult to engage in playtime, try out a mix and match of different circumstances to see if the perfect conditions will make him or her engage in activity close to every single time. Having a hard time determining what to try out? 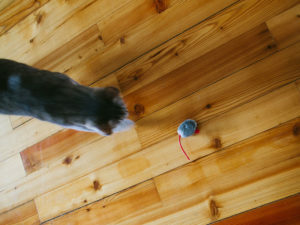 Try these techniques to help your cat engage in playtime more. 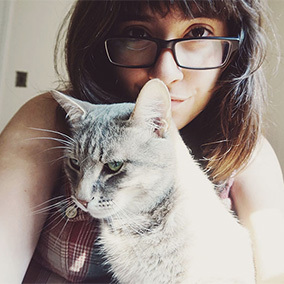 Some of my favourites from that list: have a spot specifically for playtime, try to have play time at the same time every day, get a bunch of toys similar to the ones your cat already likes, and try playing bird videos in the background so kitty can get some auditory stimulation while he/she is playing. 4. Have your cat do a workout before mealtimes. It’s incredibly easy to get a cat do a workout session if your cat is at all motivated by food. All you have to do is use this technique: and all you need to do it is kibble! Having a workout regimen for your cat where he/she does not get a meal until a workout session has been completed is the perfect way to make sure your cat is getting enough exercise without constantly keeping tabs on your cat’s exercise for the day. Exercise routines don’t replace playtime of course, since workouts do not engage a cat’s prey drive, but it’s a huge help for specifically getting exercise and physical activity levels to be better. 5. Make nooks for your cat in high places. The best exercise is exercise you don’t realize you’re doing! Cats love high spots, they love little nooks and crannies, they love cat beds, they love napping! So take that passion and turn it into a little bit of a workout – place cat nooks in high places your cat has to jump to get to! Not sure how to make this work in your own home? You don’t have to go out and buy any cat furniture, simply move around the furniture you’ve got so that it’s easy for your cat to jump from one piece to another (say from a sofa, to the sofa’s back, to a dresser), then put a little cat nook or cat bed, or even a fleece or sweater kitty likes to sleep in, at the highest spot. Your cat will love this and will not even notice the exercise aspect. Cats love a good spot, and are often quite content to jump from place to place throughout the day just to get from one of their favourite napping spots to another. Which is why I mention making more nooks and crannies as one of the many ways to keep an indoor cat entertained. Cats can keep themselves busy moving between interesting nap spots for hours! 6. Buy a nice cat tree. There’s a reason so many people go out of their way to buy these big, bulky objects that are not always the most appealing to look at: cats love them! They love playing on them, climbing them to hang out on, they love scratching them; there’s not much about cat trees that cats don’t love! Why they’re good for passive exercise, where you personally don’t have to lift a finger, is pretty obvious if you ask me! No space? Live in a small apartment? You can always grab a narrow, thin cat tree instead of a wide one! Have a cat tree already, but need a few more in places your cat spends time in infrequently? 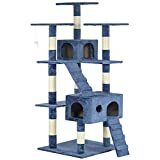 Try small cat trees you can move around from room to room. 7. Find toys your cat is willing to play with by him/herself. 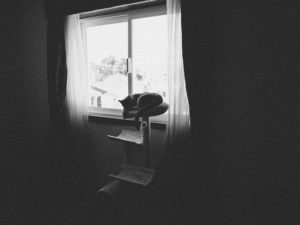 This can be a tricky one if your cat is lazy like mine (and if you’re reading this article, there’s a high chance that that’s true), but it’s possible to find something, I do believe. Need ideas on where to start? Try looking through these toys cats can play with on their own. So far, I’ve only ever found two things in my cat’s life that he’ll play with by himself, one which he now refuses to play with at all. 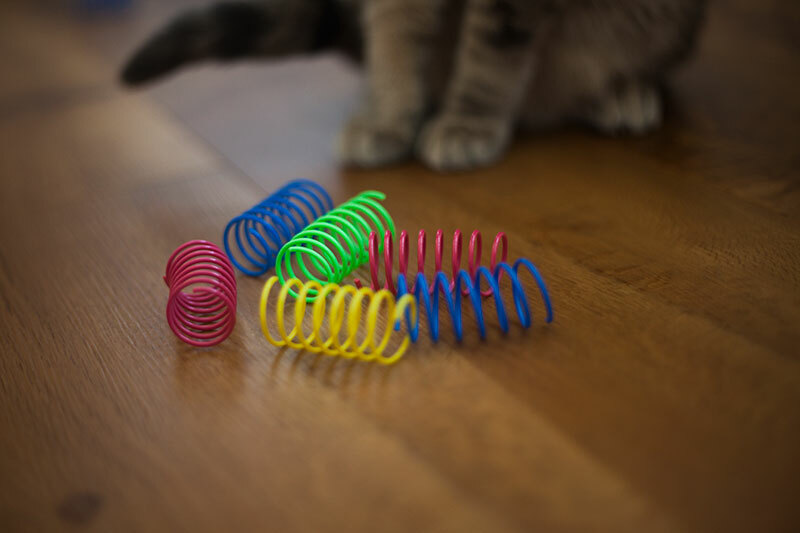 These cat springs (which he sadly no longer plays with and I find dreadfully upsetting, since I loved them so much; read my review of them here if you’re interested), and DIY aluminum foil balls that have been squished into “pancakes”. Yep, my Avery’s an odd one. 8. Make a cat shelf wall. I know this isn’t something everybody can do, especially if you rent or won’t be staying in your present home for too long, but if you at all can put up a wall full of cat shelves, I’d recommend you do it, as cats that are lazy are still likely to want to use a crazy-cool home feature like this. As an alternative, you can instead try putting up a cat climber. These take up little to no space and you definitely don’t need to put so many holes in the wall! You can even drill them into furniture, like a wardrobe, instead of drilling them into a wall, if holes in walls are a big issue. Easy to put up; easy to remove and take with you to a new home as well! 9. Try grabbing a cat wheel for your cat! Ah, the cat wheel! I feel like every cat owner has watched hours upon hours of cats running in cat wheels and thought, “Damn, I’d love to have one of those!” Nope? Just me? Well either way, I’d say if you had one of these in your own home and your cat liked to use it, you’d be pretty much set for life about the whole cat-not-getting-enough-exercise thing. The downside is of course that cat wheels are very expensive, and if you grab one and your cat doesn’t like using it, well that’s a huge lot of $$$ wasted – especially if there isn’t another cat in your life you can “donate” your unloved cat things to (like I do with Walker and Beau, my mother’s and brother’s cats, when Avery doesn’t take to a cat toy). It’s certainly not a necessity, but trying out a cat wheel to see if Avery likes it is definitely a huge wishlist item for me. Your Advice: How To Get Cats to Exercise More? Now it’s time for me to turn the tables over to you. 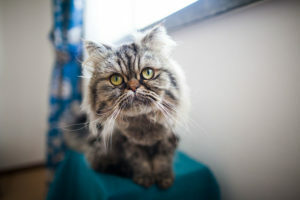 What can you think of to get cats who are not getting enough exercise to exercise more? Have you ever been in this situation yourself with one or more of your cats? How did you resolve the situation, or is it a constant struggle? 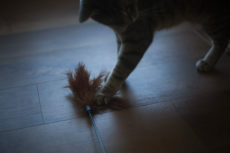 Do you have any ideas for cat toys a kitty just might play with on his or her own? Let me know your thoughts in the comments down below! 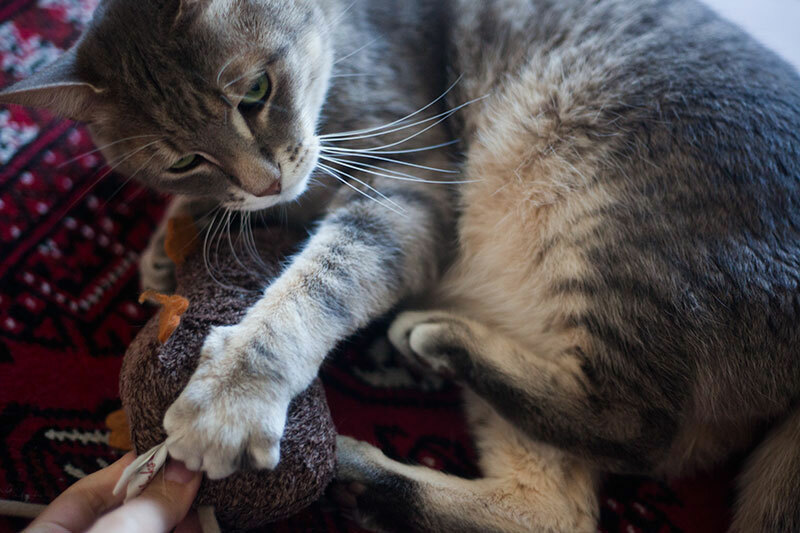 My cats like the idea of toys… if they don’t have to move and I bring the toy to them. Fortunately, our apartment building has a relatively contained inner courtyard and my cats love to go outside and check out everything (while I’m there to baby sit). They spend the day peeking out of my window so they get excited to greet the people and plants in person. They’ll also run up and down the stairs at rates I didn’t know they could achieve! I know of other people who leash-train their cats to give them some outside time in neighborhoods that aren’t so safe for free-roming kitties. My, my what social cats they are! Avery is terrified of people he isn’t used to. Wish I could do this kind of thing with him, but he’d be petrified even if someone new came to the window to greet him. I think it takes a special kind of cat to be so courageous and friendly – you should be so proud that all your cats are like this! 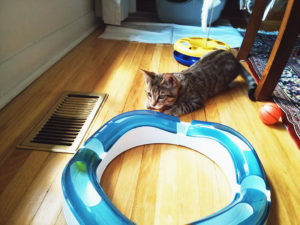 I’ve found the same thing works for my kitty nephew that works for my dog Honey–rotate toys. Anyone can get tired of the same old toy. But hiding a favorite for a while and bringing it back out can re-energize interest. Very good point! 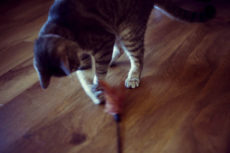 Right now I feel like I have to use nearly every cat toy in my arsenal that Avery likes to get him to play some days. Can’t wait til I have enough that I can hide some so I can do a rotation through. Any tips on how long a toy should ideally be hidden before it’s brought back? Great tips, I will skip the cat wheel though, I have a feeling they would use it as often as I did my treadmill. Hmmmmmm, does running from the Medicine Man count as exercise? Daisy Mae my cat is 11 now and does very exercising but does still play pole and likes her catnip mat and toy. She’s an older cat so she sleeps most of the day. That’s great that she still plays pole and likes her catnip mat & toy! I do think cats mellow out a lot as they age… which makes me wonder how lazy Avery will become when he’s old! Take them out for a walk on a leash. You will get tired before they do! I have seen video of cats using a cat wheel, but they were very young. If I bought one for $200 the cats would just sleep around it, and probably laugh! Lol! 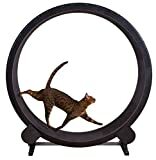 Okay maybe the wheel is a long shot for Avery, but I think Walker (my mum’s cat) would get good use out of it as he loves to run. Definitely not spending that kind of money right now, but maybe I’ll look for some instructions and DIY one, one of these days. I would love to take Avery out on a leash, but each and every time we tried he’s literally had a panic attack at “outside sounds” and darted away. We nearly lost him a couple times. He’s very strong and very flighty, so it’s not a good combination. I used to take him out in his carrier when we were back in Canada, and I think if I kept that up he’d eventually become less stressed outside and so less flighty, but it’ll take some serious time I’d think. I’ve to admit that I’m in general not a supporter of keeping only one cat. That being said, older rescue cats who have been kept alone their whole life, may not be able to adjust anymore to another cat. But cats do need other cats, and playing / exercise is just one of the reasons. I have to empathize; I know how hard it is to encourage them. Some days I do skip and let Avery be lazy, but most I try really hard to make sure he’s done at least some exercise. Working in a routine where he has a workout before each meal really helps me feel like it’s okay to skip a day if he really isn’t engaging in playtime. I’d love to get Avery a sibling, have been wanting to for ages, but being in such a small flat (a studio, not even a 1 bedroom) means if the cats don’t get along, they don’t have anywhere to have a “time out” away from one another, which I don’t think is healthy, especially when they’re first being introduced. Once we move to a slightly bigger place, we’ll definitely be getting him a sibling, or even two if there are siblings that need a home when we look.